It’s been a very busy couple weeks around here as the market deadlines are approaching. I finished up a bunch of quilts in time to sew binding in the car on the way to Montana last week. I got six table runners finished on the ride down, in the hopes that I could do some of my book photography there. I didn’t get much of what I would call perfect photography light, as it was either rainy or sunny, but I did get a few shots with some beautiful mountains in the background (more on that in a week or two). We were gone eight days and drove 3000 miles. I met lots of quilters and stopped in at a few quilt and yarn shops along the way. The scenery was beautiful, but I am happy to be back home – back to my own bed and my regular routine. Well, I guess I wouldn’t call it quite my regular routine, because my book deadline is about a week out, so actually it’s crunch time. I’m trying to finish up my photography, but it’s been raining outside everyday so I have been catching up on a few things inside. I have writing, proofing, and book layout to work on. I also have blogging to catch up on. Last month my first blogiversary came and went and I was so busy I didn’t get a chance to celebrate. I am going to make up for that by having a HUGE belated blogiversary party! There will be cake for me (I ate some props from the photo shoot) and prizes for you. Since you all couldn’t be here is person to help me celebrate, I got this little munchkin to help me eat the props. She just digs right in. I tried to get slightly less frosting on my face. Forget about frosting, did you say Prizes? Yes, I did. There are a few prizes to be exact. First up, the GRAND prize will be one of my quilts. It’s called Cotton Candy and can be found in my On A Roll book. Here’s a shot of some of the machine quilting. I love the echo quilting in the border – it highlights the fabric so well. The fabric is designed by April Cornell (for Moda). I love the cheery colors. April Cornell stopped by my booth at spring market and thanked me for using her fabric. When I got home, she had sent me an autographed copy of one of her hardcover books. I thought it was such a nice gesture that she took the time to do that! This also gives me a chance to show a color option – Here is the original quilt, also done with April Cornell’s fabric. It was her first line with Moda, called the Poetry Collection. I made so many quilts with this fabric! Second prize is another quilt, but this one is a bit smaller. It’s from my Little Charmers 5 and is made with Hemming House fabric by Moda. Here’s is the original, featuring the Fig and Plum fabric line by Fig Tree. The third prize will be a stack of charm squares and a few patterns to go with them. In addition to giving away 3 prizes, I’m going to give you 3 chances to win. First, just leave me a comment to enter. I’d like to hear what you enjoyed learning about most from visiting this blog in the past year. This will help me with ideas of what to blog about in the future! Or you can just tell me what you want to see/learn about! If you would like a Second chance to win, you can blog about this giveaway on your blog. Stop back and leave a second comment with the link. If you would like a Third chance to win, just add me to your blog roll. If I’m already on your blog roll, just leave me a third comment saying so. I also just want to say thanks to all of my readers and quilting friends out there. This blogiversary is my chance to tell you – I SO enjoy reading all of your comments and having a chance to connect with other quilters. Honestly, I spend many hours alone working in my studio, so a blog is a great chance to “meet” with other quilters on a regular basis. My hope is to leave you with some inspiration and a few tricks along the way. My other hope is that you will continue to stop by! This entry was posted in Quilting and tagged April Cornell fabric, giveaway, Little Charmers 5, Moda, On a Roll. Bookmark the permalink. Glory day! Could I really be first?? That must significantly upgrade my chance of winning, no?? I love the house renovation pictures. The before and after comparison is astounding! I’ve really enjoyed some the tools and tricks that you use when making your quilts. Your work is very inspiring, thank you! I just love looking at fabrics and getting new ideas for quilt patterns. You are on my blogroll too! I made quilts out of both of the April Cornell lines too. Your blog is generally interesting, I feel like I know you from reading it, but what I especially like are tips you provide. You make a lot of quilts and seem to know how to do things quicker and easier to get excellent results. I love your prizes! Then again, I love your quilts! You are on my blog roll-have been since I found your blog! The favorite thing I have learned so far from your blog is that I LOVE (in a sick and twisted way, of course) remodeling. Your home tour, before and after shots were amazing. Your stories about the ‘money pit’ etc etc, just reminded me of so many experiences I had growing up. Your home turned out beautifully. I of course, also loved your quilts and projects. You are an amazing pattern designer too! I love to look at the beautiful quilts and fabrics and it encourages me to move ahead and work on projects I have yet to start! 🙂 Fun Blog! You are on my blog roll too! I hope I can win a beautiful quilt! Would be amazing! I love coming to your blog for inspiration and to see your color combos. They have really been inspiring and make me want to go work. Love the colors in the blue and yellow one! I’ve really enjoyed watching that house of yours being transformed through the pictures and tales you’ve told. Of course, the quilts are a big reason for coming back, too! :o) Actually, it’s your use of color and your beautiful but simple designs that really keep me coming back. I’ve got Around the Block cut and ready to sew and I can’t wait to see the finished product. Please keep inspiring us all! Congrats on your blog anniversary! I enjoy reading your blog… love the tips, (like the binding one you did many months ago), the tools you like to use, the sneak peaks of your quilts/patterns and new fabric lines. I like to see what you are doing… knitting, remodeling, etc. I miss reading your blog when you are out of town or super busy. Can’t wait to see the photos for your new book! Way to go! Keep up the good work. you’ve been living on my blog roll for a long time. Wow you know how to celebrate girl!!! First I loved the house renovation, that really kept me coming back, we have built a home and I love hearing about other people adventures. I really enjoy seeing all the peeks and tips from your design processes. So thank you for sharing your talents and gifts for your blogiversary. I love seeing sneak peeks of your patterns/fabric and I enjoyed seeing the remodel of your home. I would love to see a machine quilting book. Quilting a quilt top scares me…what if I mess it up after all the work I put in to piecing it. You do such a beautiful job quilting on your long arm. Happy Blog Anniversary!! I love all the different colorways you show for your quilts. It makes it easy for me to imagine your patterns done in my favorite colors or in fabrics I have in my stash. Congratulations on your blog anniversary! You’ve been wriitng this blog for a year and I’ve been enjoying it for a year. Thanks so so much for the binding tips! Happy Blogaversary!!! I have learned so much from your blog – especially your tips for binding. They turned a chore for me into something that I enjoy doing now. Thanks! BTW, you are in my blog roll (i.e. Google Reader). Thanks for the chances to enter! You are on my blog roll and have been the whole time I’ve had my blog. You are one of my favorite quilt designers. Happy blogiversary! Wow, I think what I have learned, gleaned from your blog is how beautifully you coordinate and use color. That is one of my biggest struggles. I have also enjoyed all your tips. And your beautiful photography! Thanks for the awesome giveaway. I really enjoy your blog and your patterns. You design quilts and table runners that are fun to make! I’ve learned a lot from your blog such as tips on sewing bindings and info on your favorite tools as well! Happy blogiversary…and I can’t wait to see your new patterns for market! Happy Blogaversary to you! Your quilts are beautiful! I eagerly look forward to your new books & patterns. I so admire your sense of color. Would you come remodel my house for me — pretty please?!? I love seeing what other quilters are using for fabrics and patterns. You do such lovely finishing work — your quilts are always so a joy to view. I have to say that I have learned a thing or two about color choices while visiting here. The tutorial on binding inside corners was perfect, I put your technique to use and it worked! I feel inspired by your work, thank you and happy bloggaversary. Lol, a new word?! I love your blog -I enjoy your patterns, fabric and shots of your little girl!! Your give away is incredible. I will definitely be talking about it on my blog tomorrow morning. I will email you then so that you can check up on me…See you in the morning! I think I enjoy seeing your new patterns and books and the quilts you feature in them. I like seeing the various color options because it helps me “out of the box”. (Those little fingers look oh so sticky. What a cutie.) Sorry I don’t have a blog. Oops- forgot to mention that I just started and finished piecing your framed four patch runner today. I used Madeiro. I have you on my google reader! I love when I see posts from you! I have to say the post I loved the most from you was when you posted all your pics of your before and after “biggest mistake”. 🙂 I love you as a designer with fabric but I loved seeing everything you did in your home! I find all the binding tips very helpful… As you have been designing a while, I think you can offer a lot of technical knowledge from doing such a volume of work yourself. Also, I really like the fav tools post. And enjoyed all the house posts. A very generous give away! I love your blog for all your little helpful hints. Happy blogiversary. May you have many more! I have been reading your blog since day 1. I love your color options that you show for your patterns. After seeing the blue and yellow quilt, I’m definitely going to make the pattern from your On A Roll book. That’s my next project. I loved seeing how you decorate your house and I’ve really enjoyed your info on quilting tools and methods of binding. What a fabulous give away!! WOW!! You are so talented. I love your use of color. You have inspired me. My second entry – I have you on my blog roll and have had you there a few months. I love that you always have great ideas for pre cuts…..keep them coming!! I just love seeing what new quilts you’ve been making, as well as your “how to” guides. Your photos are always stunning. You are definitely on my blog roll! I like seeing the finished quilts but I also like the hints and tips, like the binding how to. they are extremely useful. I love seeing your patterns, the fabric you use, and the tips and tricks you tell us about! What a delightful give-away. How nice of you to do this. All your prizes are absolutely beautiful. I’m sure whomever wins will treasure them. I know I would. Wow! What a great giveaway! Happy Bloggaversary! Congratulations on your Blogiversary. I have been following your blog all year and look forward to your new postings. I just love the way you put your fabrics together. Your quilts are so bright and cheerful. I used your tip on bias cut binding on a quilt I made using your Meadow Lane pattern. I would have never thought to fold the material the way you showed in your instructions. It was so easy and worked out perfectly. Thanks for sharing your wonderful gift to inspire us to quilt and quilt and quilt. Can’t wait to see your new book! love seeing your workspace learning new tips and yes the quilts in progress and finished. Thank you for sharing your creativity! your fabrics are inspiring, but your quilts are a joy to see. I’m looking forward to your generous giveaway! I like to see the different color options that you have made with your quilts. I love to see the new stuff as it comes out! My kids are in school in 3 days, so I get to quilt!!! Hi …I love your blog and what I love about it is that you show all your projects and they just inspire me totally. I love how you choose colours to put together and your different quilts done in different colours are a good thing too. I always read it…may not always have time to comment but I do read it. What great prizes! The quilts are beatiful as always. Thanks for the chance to win!! I added you to my blog list. I love your patterns and to see the quilts you made. I am always amazed about your colour chice and they inspire me a lot. Thanks for this great give away. Thanks so much for the great giveaway…your binding tips are my fav and in general how you mix your colors is inspiring. Congrats on your milestone! Your are now settled into my google reader. Happy belated blog anniversary! Love coming and checking out your blog, everytime I am on it I’m inspired! Thanks for sharing your many many talents and stories with us! You were put on my blog roll the first time I found your blog! Keep up the great work!!! I stumbled across your blog a couple of weeks ago and immediately subscribed! The little munchkin is absolutely adorable! I love the knitting pics. The Feathers and Fan Cardigan is so beautiful! And thanks a lot for this fantastic giveaway! I am new here and will be back! Very inspiring and beautiful talent! I have added you to my blogroll! I had to blog about this giveaway! I love your quilting, knitting, and family pictures! You are on my blogroll (google reader). I started reading your blog during the blog hop and have benefited from your tips and techniques, and sharing the creative process. Congrats on your blog anniversary. Congrats on your blogiversary. I like seeing EVERY new quilt you design and your fabric ranges. Also you have very generous giveaways which are fun to enter. I have a nice little collection of your pattern books. Love to read them even if I don’t get time to make much. You have been on the blog roll on my sidebar since the day I discovered your blog. I am in awe!! I have learned from your blog tons about color, but also great ways to use those pre-cuts. I love your books and patterns and have several!! Thanks for the giveaway! Your are on my blog roll and have been for quite some time. Thanks for a fantastic giveaway. I love seeing all your quilts from your patterns on your blog. It helps me decide which book or pattern I want. Hi this is the first time to your web and I’m going to follow now great site can’t wait to read more and more. Happy Blogiversary! I’ve enjoyed reading about your house remodeling, seeing your quilting projects and just about everything. And you’re in my blogroll. OMG! I just absolutely LOVE your quilts! To win one of your quilts would be my ultimate wish! I have followed all of your tips and love them–they are truly helpful and that is what I enjoy most about your blog–however, the second thing I like is seeing finished projects! 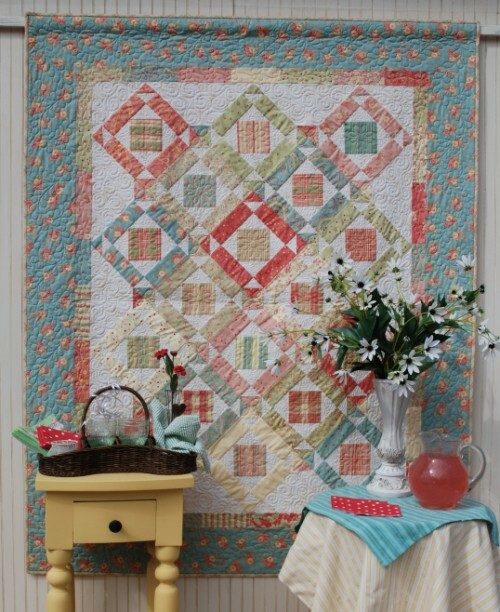 I love the quilt on the table in this post–would love to see the entire quilt. I enjoyed the MN blog hop also! Thanks so much! Such a generous giveaway. I love how you photograph your quilts but I really love how you show us more than one colorway. Very time consuming on your part but always appealing. That is the cutest cupcake tester! I love your books and patterns. One of my favorite quilts that I have made is from one of your patterns. In fact I liked the picture of the one you made that I used the same fabric line for mine! Your hints are also great! I so enjoy your photos and they were the inspiration to make your Little Charmers IV table runner last week. I am inspired by your creativity. I love seeing your quilts, classic yet modern. I have been a long time follower of your blog. Being on your blog roll makes sure I never miss a post. I just stumbled upon your blog and I love it! You have made some very gorgeous quilts. I have posted about your give away on my blog. Love to sew the wonderful color combinations you have. Old Garment sewers like to be too matchie, matchie. Adding you to my blog roll. Lovely give away you are having. I’d love to have a chance to win! I visit you regulary and read about everything you write. Your work is inspirational. I have several of your books and patterns. I always look forward to seeing the pictures on your blog. Now I have posted about the giveaway on my blog. And I have you on my blogroll in Google Reader. Hope this gives me all the chances I can possibly get to wint this wonderful giveaway! Your patterns are very inspiring and very easy to follow. Love the fact that you present different colorways for the same pattern, and show us how to use those pre-cuts. I started sewing/quilting just about a year ago, and I find good pattern direction is a must. I don’t have time to start a blog myself and also, as you say, don’t know what to blog about, but I really enjoy reading other quilters’ blogs. A lot of time they blog about their finished quilts (with beautiful pictures), techniques, and sometimes family including their pets. Thanks for the generous giveaway. I love April Cornell’s Sunshine fabric, but I started this fabric addiction a bit too late (can’t wait for her newest line– Nature’s notebook). I love seeing all your finished quilts…so inspirational! The tips and tricks that you share are awesome too!! What an awesome giveaway…I am keeping my fingers crossed!!!! oh! I follow you in google reader! I love your quilts, your designs are great. I enjoy reading your tips, it is always great to learn something new. What I love about visiting here is seeing your quilts and how you decorate with them. I get a lot of inspiration from just seeing your beautiful quilts and I especially love when you show it in 2 colorways. I seem to have trouble picturing things a different way and seeing how you change it up is fabulous. I also love it when you show how you use them in your home. Great ideas that I may not have thought of. By the way, you’ve been on my blog roll for a while! Sinceramente su blog es un encanto. Para una quilter novata, es toda una inspiracion y por supuesto fuente de aprendizaje. Espero tener alguno de sus regalos seria un precioso tesoro para mi. Está usted en mi blogroll de mi blog, en el lateral izquierdo, donde el titulo es blogs de patchwork. Gracias por la oportunidad de tener uno de sus regalos. I love all your quilts. I have made the smaller one and given it to a friend for Christmas, but one of my own would be wonderful. Love April Cornell’s fabrics and your designs together. Happy Anniversary! Heather, you have been so busy. I hope you get a bit of rest time in during the next week sometimes that helps the deadlines, too. I just love all of the quilts you posted (I always love your designs) and your fabric choices are among my favorites. Whoever wins will be lucky, lucky, lucky and blessed! Best wishes on all your work and deadlines this week. Happy blog anniversary. I have really enjoyed your posts and tutorials and must say I love your blog. You’re already on my blogroll. Forgot to say, I love that cupcake face! Too cute. I am off to post about your giveaway. OOH, such beautiful quilts! Such a wonderful giveaway! What a beautiful giveaway..Just linked from Life’s A Stitch,, so glad I did. Also that new fabric line is awesome. Who wouldn’t love those colors and flowers. Your family is so sweet and such treasures. Yes, winter is not far off as the days are cooler here in Illinois already, good luck. I appreciate your patterns and ideas! Thanks! Besides having studio envy, I’d like to see your space up close and personal, to get great ideas for organizing and making my space efficient. I’d like to see some freehand quilting designs and how to do them. Working with color is another area I’m weak in….need plenty of help all around as you can see! Happy blogaversary. What wonderful, generous prizes! Hope I win! I love your patterns and how you write them. I have all of your tabletoppers patterns and have made a few in MULTIPLE fabrics. They are so versatile! I mostly enjoy the inspiration I receive from the projects you post. It spurs me on to try new projects. I love your fabric choices and colors. Loved your trunk show last Monday night in Oakdale! Thanks! Congratulations on your anniversary. I enjoy reading your blog. I just ordered Little Charmers 5 in my LQS. I love your color selections. I would like a tutuorial on how you choose your colors. Maybe like showing a charm pack and how you divide it up and put in into a tablerunner. Heather…I would so love to display one of the quilts in my home! I’ve long admired your work and read your blog whenever you post. I love how you display your quilts in the various fabrics. It gives me so many ideas and of course your tutorials are always a learning step. Thanks so much for sharing your talent. Hi-the quilt is beautiful-thanks for the chance to win…I have enjoyed seeing the fabrics before they are released and the photos of Green Lake—I have loved the tutorials on your web site..I am going to try the binding hints today…thanks for all the great information(and the great patterns………..) It is fun to see how someone creates…..and what inspires them…..
and I am on your blog roll too……….. Happy Blog Anniversay! I love your books, quilts, fabrics …. It is always fun to read your latest blog post. I blogged about it too 🙂 who wouldn’t want to win one of those gorgeous quilts?? Me encanta su página y sus diseños! Son colores frescos, reales y los combina de un modo fantástico! Mis más sinceras felicitaciones por su blog aniversario! Desearía por favor, que me anote en su sorteo! Sería un honor tener en mis manos una de sus labores! Me voy a publicar la noticia en mi blog y regreso! Muchas gracias por realizar el sorteo y permitirnos participar y muchos cariños! I love your page and your designs! Colors are fresh, real and combines a fantastic way! My heartfelt congratulations on your blog anniversary! I would like please write me in your drawing! It would be an honor to get my hands on one of their labors! I’m going to publish the story on my blog and back! You are so talented! I love looking at your blog. Thanks so much for your blog – I always enjoy your posts. Your talents are many! Your new fabric is gorgeous, especially love that there is a chocolate brown background with the red flowers. What i like most about your blog is that I can get quilting/fabric and knitting all in the same visit, and the pictures showing off your projects are beautiful! También la he adicionado a mi Lista de Blogs! I have also added to my list of Blogs! I’ve learned lots of tips and tricks to try and implement in my own quilting. I have really enjoyed seeing your patterns and quilts. Congratulations on your blog anniversary! I always enjoy checking out your fabric selections and noticing how beautifully they go together in your quilts..and reading your tips, too. I love your giveaway, too! I’ve added this giveaway to my website sidebar! And I became a follower….just wish I had found you sooner! This is my first trip to your Blog so I don’t really think it’s appropriate to enter but I did want to say how much I lovvve Cotton Candy! I think I might even have your book. Have to look. At any rate, congratulations and thanks to Patchwork Penquin for sharing your Blog. Heather, I really enjoy reading your blog and looking at the great Minnesota lake photos! I have always spent summer vacations at a lake in MN. It is always a reminder of fun times. Thanks. I just found your blog..just messing around, do not even know how I got here. I love it, and I love the quilts. Please enter me. Thanks. Because I’m so color-challenged, I love seeing how you put fabrics together for your patterns. I have a “sunshine” charm pack but can’t bring myself to use it since it’s so pretty. Happy anniversary! I wouldn’t change I thing about your blog and enjoy visiting it regularly. I have enjoyed your designs for quite some time now and you have also been on my blog roll for quite some time also. Thanks for offering all the wonderful prizes. I just love your blog. You have such creativity oozing from you and your projects are lovely. I have several of your patterns and have made up a few. I love the knitting thing as well. I love to knit also. ps you are also on my blog roll…. I have to say there are many things on your blog that keep me coming back; the quilt patterns!! and how you use different fabrics; the house remodel because we also majorly remodeled our dream lake home (along with all the headaches) so it was fun to see what you did; your binding tutorial is great and I refer people to it all the time. Happy anniversary of your blog! Of course you are on my blog roll!! What an amazing prize. I love to see how others are using their stash. I love new ideas and patterns. I love your blog, I love your style! It give me incentive to look at your gorgeous quilts. I really love tutorials. They give me the extra push I sometimes need to start a project. What a dream to be able to win one of your quilts! yOUR QUILTS AND PHOTOS OF THEM ARE FANTASTIC! jUST GLAD YOU CAN’T SEE WHAT my QUILTING ROOM LOOKS LIKE!!! I love the tips, oh and the quilts! I have also added a link to your blog on mine. Hi Heather, this is the first time I have been to your blog and it is just wonderful. I am stuck on “stitching in the ditch” and frozen in fear to move past it. Would there be any chance of some sort of “easy as pie” tutorial to move beyond the ditch to some simple loopy type machine quilting..not stippling…think that’s the one that caused me to freeze. Thankyou for your generous giveaway…would love to be included. Well, first off, I love your quilting! Secondly, I love your house! It looks very homey and inviting! Thank you so much for this opportunity to win prizes. I so enjoy that you share your creative process and ideas with us. I’m a fairly new follower, but I really enjoy your use of color and the few tips/ tutorials I seen have been great! I haven’t taken a moment to put you on my blog roll, but you are in my google reader. Does that count? Thanks for the chance to win!! I enjoy reading your blog. I have several of your books and patterns. I enjoy getting peeks of upcoming patterns. I love blue and yellow. I have made that same quilt but in a different Moda fabric for my niece. I really enjoy your gooks and patterns. Can’t wait to see your next book. I’ve just added you to my blogroll. I can’t beleive you weren’t there already seeing as I enjoy your blog a lot. I sub to you on Bloglines, and I’m really glad I do. I love reading about all the new fabrics, patterns and books coming out. I love all your knitting posts because you make knitting cool again! And I have to say that learning about your house and Joel’s dog were highlights in blogging for me! And I meant BOOKS. I should check my typing before posting a comment. Sorry. My favorite tip on your blog is how to do binding. Such a great way to finish off a quilt. Joining the fun here. Just stumbled on your blog today and haven’t had a chance to read all your tips I don’t think, but it was interesting and helpful to read about your method for loading stitches while hand stitching a binding. and as a reader of your blog, I want to thank you for giving us three chances to enter – (I have also added you to my blog roll) Thanks so much Heather, your stuff is amazing! Love your projects, pix of your fabrics. Your patterns really work. I love seeing your beautiful quilts! You have such a nice color eye, your quilts are so visually pleasing! Love your tips on binding too! I love your work, your things are always so beautiful. This is quite the fun giveaway! I am excited to see what else you have in the works. Congratulations on your 1 year anniversary! I love the fact that your blog shows so many interesting patterns, and fabric combinations. It definitely gives me food for thought when it comes to starting a new project. I lke the quilt, it´s beautiful. Love the giveaways. i put in my blogrolls. Thanks you. Oh wow, these are gorgeous. My mom would definitely love them. I just came across the blog but I love the photos you have up…the ones you post your items with and the family shots. So great! I love looking at all the colours in your quilts. I don’t quilt a lot (mostly because quilting projects aren’t as portable as knitting projects), but looking at quilts inspires me to do other crafts. I love the looking at the colour choices. Beautiful pictures. Oh my! I am new on this blog: just followed other links and then found this fabulous thread. I found out that there are tutorials so I will be back alot! Thanks to sharing! My thread are in Swedish but you will find a link to your page and I will tell friends about your give-away!!!!! wow, I would love a chance to win. I put you on my blog roll….and by the way….great site!! I love looking at your blog for inspiration! I check it everyday. I just blogged about your give away on my blog! I also just added you to my blog roll! Thanks for a great giveaway! I mainly just love looking at your quilts-especially how you machine quilt them. And your fabric choices are so beautiful! Love everything! Also, I have you on my blogroll! Thanks for hosting such a generous giveaway- Your quilts are beautiful and the quilting is stunning on the blue one. I have followed your blog since the Minnesota Hop in the summer and enjoy looking at your designs and your fabrics. It is interesting to learn about the process of developing a fabric line too. I hope you have a fabulous bloganniversary and that you continue to enjoy your blogging journey. Your little one looks like a real sweetie pie with a face full of cake and icing – too cute for words. All these prizes are so great that I almost don’t know which one I want most! Wow Heather! You’ve been busy!!! Sounds like market was good for you! well, I have enjoyed, one meeting you. Seeing how you work, and your showing of your pattern design to be very interesting to see. you had a binding tutorial at one time, about doing it faster, that sticks in my brain as being very helpful. What a great give away. i’ll sit and cross my fingers and toes, and HOPE! I always enjoy reading your blog. I love the vibrant colors you use and the alternate color choices. My favorite postings were your house renovation – love how it turned out!! I’ve loved getting a sneak peek at your design process and up-coming books/patterns. I’ve made several of your quilts this year and I so appeciate your precise instructions. Thanks for your bias binding technique. I use it all the time! I don’t have my own blog, but you’re tops on my blog roll. Thanks! I just learned about your blog from another blog. I LOVE your books and patterns. How awesome to actually leave a comment for you! What a wonderful giveaway – please enter me into your draw! Regarding your gift of prizes, I would be extremely honored to have one live in my home. I own “On A Roll” & “On A Roll Again”; I altered your Cotton Candy pattern into an oval tablecloth and everyone who sees it always has a favorable . I love the colors you use in your fabric and the patterns too. I can only hope to get to your level someday! I would also LOVE to win that quilt! Blue is my favorite color! #3) I haven’t a blog, and I am now subscribing to yours Heather…I hope this still allows me to entered your contest for a second time. Love your landscape photo at the top of this blog, just beautiful. Where did you take this? Added you to my blogroll as well! and now i’m following your blog…….. I enjoyed seeing what you were working on-the sneak peak. I also enjoyed seeing the geography where you live. Your views and backdrops are beautiful. Gorgeous prizes! Thanks for the chance to win. I am subscribed to your blog via Google Reader. I love looking at the quilting and getting inspired from what you have done. I’m always looking to improve on what I can do and willing to try new things, so seeing the close up quilts is like going to a quilt show every day! I also have you listed in my favorite blogs on the sidebar on my blog (if that is what a blogroll is) and visit every time you update. I have enjoyed your blog for about 6 months now…and appreciated your instruction on binding a little while ago. I also enjoyed the memories that you shared of your beautiful home. You and your husband are blessed to have so much talent. OK…pass me one of those pretty cupcakes…! I posted about your give away today on my blog. You are also on my Following List. I love your give away. Thanks for the chance to win! I truly enjoy the patterns and your eye for color combinations. You are on my favorite blogs and I will post your giveaway on my own blog. You are so very generous with your giveaway. I really enjoy your tips and the beautiful photography on your blog. You are sooo talented and inspiring! These are awesome quilts and awesome give aways! I am always inspired by seeing what expert quilters are able to accomplish! I need to learn more about machine quilting! I always love to learn new things to do with precut fabrics like jelly rolls and charm packs. I also blogged about your blogiversary giveaway. Your blog provides so much inspiration through your photo’s, colour choices and the use of your beautiful quilts. Being a self taught quilter it is so helpful to learn how to do things the right way, it makes quilting so much more enjoyable. Thank you. Thank you for the spectacular giveaway!! I have your blog on my Google reader and always love your tutorials. Looking forward to lots more great ideas and designs from you in the future! Wow….what gorgeous quilts! 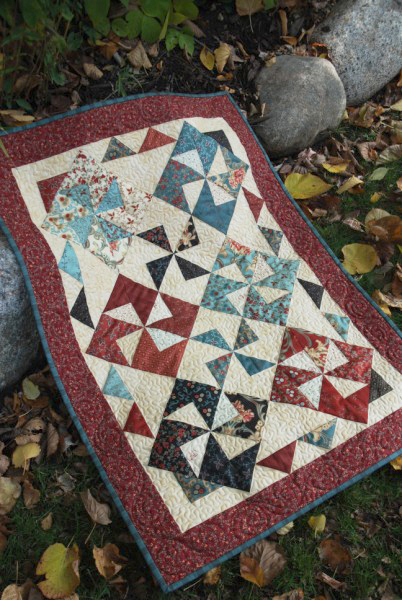 I love the quilting that you did with the swirls…fabulous. I am just new but I think I will be learning a lot from your blog. Love the cute little cupcake face. She has such a gorgeous smile. I’ve added you to follow too. Happy Anniversary! Love your blog and viewing your wonderful creations! Great inspirations! First of all the love your scenic background for the pictures. I wish my garden looked like that. I also love your color options . You always make everything work so well together. Love seeing your quilts in different colorways. Your family photos are fun. It’s nice to meet the person behind the patterns. Thanks for all of your tips along the way. Very helpful for new quilters. Heather…whether I win or not I love all that you share! Your work is beautiful! Whenever I see that you have posted on your blog consider that you have made my day! Love your designs and would be so happy if I could win one of your quilts! I would have to say ~ your use of color and color placement! It’s really been an inspiration to me. Thanks and Thanks for the chance to win! You are on my blog roll and in my blog reader, always has been ~ always will be! Thank you Heather. Can’t wait to see all your new goods soon. Your blog is always fresh and inspirational!! Keep up the great work! You have such a wonderful eye for design and color, I am always happy when I use one of your patterns and/or fabric lines. 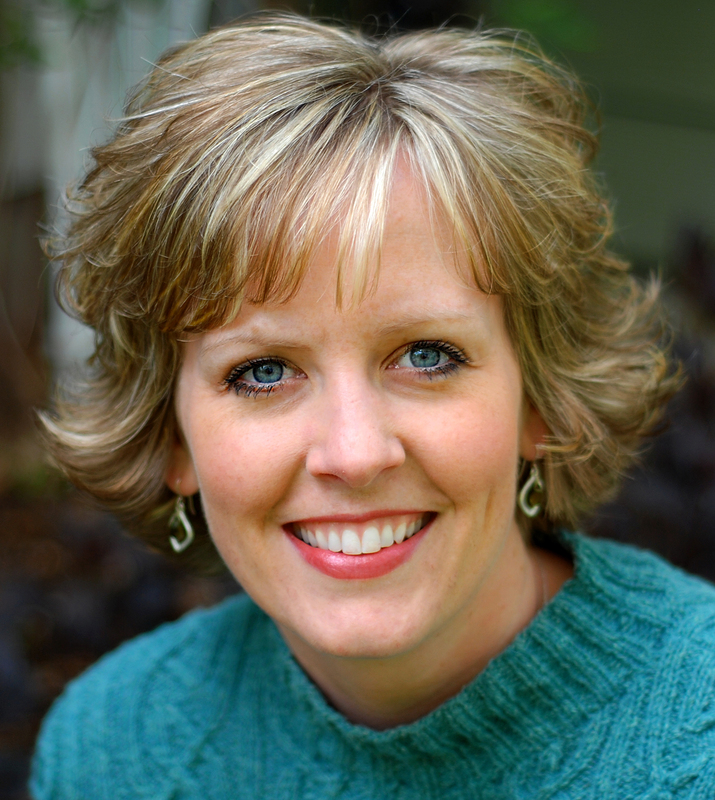 Heather, I LOVE your blog! I have a few of your patterns and would love the chance to win more!! I find your patterns unique and refreshing; simple, but SO lovely to look at! I love to gather new techniques, and get different color options for quilts. And…..I am very interested in taking up knitting!! Thanks for sharing all of your projects with us. congradulations on your blogiversry. have been reading your blog, love it. love your fabric colours choices! your designs are so inspiring too . your on my blog roll too. sue. Congats on your anniversary and thanks for the giveaways! I have enjoyed the photos of the work you have done on your home and I love your studio, hope to one day use some of the ideas in my own workroom. Also I love seeing the same quilt made in several color options – course all that makes me want to do is buy more fabric!! I loved your binding tutorial and have used the tips! I purchased straw needles and hand quilting thread even. Works like a charm. I love all the tips and tricks you show and the color options. Happy blogiversary. Me rindo ante tanta belleza. Que Dios la bendiga por siempre. I love seeing all the color options; I enjoy seeing how different the same quilt pattern looks when made out of different colors. And of course, I love the handy quilting tips too. It’s all great! I don’t have a blog, so only have 1 chance to win. Wow…to win a quilt giveaway from you would be off the roof freaking fantastic! Please count me in. Now to go add you to my side bar…I”ll be back in a sec. I loved seeing color options….also just a few days ago I posted a quilt from one of your patterns…be sure to check it out. Your now on my side bar and I’ve listed you too! This is a great blogiversary party! What wonderful prizes. I’m keeping my fingers crossed. This is my first time to read your blog and I am impressed!!!! Thanks for including me in your wonderful giveaway. It would be great to win one of the prizes. I love your blog. I love to see the different projects you make and what kind of fabrics you use. It really inspires me. Thanks for sharing that with us. Your blog provides a lot of eye candy for this quilter want-to-be. Your work is great and I think you add a lot to the quilting community. You are your own style and that’s refreshing! Thanks for investing your time with us! I love the colors and the pattern of the bule and yellow quilt. Your quilting is lovely. Thanks for the opportunity to see your work and for the chance to win. I really enjoy stopping by and reading up on the happenings–almost like stopping, chatting, catching up with an old friend. Congratulations on your blogiversary! I enjoy reading your blog and am in awe of your work. What could be better than receiving a finished project from you! I love your quilts! Thanks for the great giveaway! Hi, You are new to my google reader, I have been around you for a few weeks, I just enjoy reading your blog and I am so inspired by someone who can do all you do, raise a family and enjoy have a business working with soimething you love. thank you for the chnace to win one of your stunning works of art, it is so kind of you!!! I added your giveaway on my blog roll, did I say I’d like to win the quilts?, lol I love them!, ty for the giveaway! I love looking at the colors in your quilts. All of them are just beautiful. Please enter me in your giveaway. I have now blogged about your giveaway! Happy Blogaversary! What a wonderful giveaway! Count me in! I love all the inspiration that I find here – from the beautiful fabrics to the gorgeous patterns. Keep more of the same coming! Second comment here just letting you know I follow you through Google Reader. Pick me! I love your patterns and especially your fabric choices! I’ve added you to my blog roll! Happy anniversary! All of your work is so beautiful and tastfully done. It would be a pleasure and an honor to be a recipient of your work. I would also be tickled pink with a charm pack and pattern. Thank you for the opportunity! Happy Blogaversary! I was at the trunk show in Spearfish, SD – so much inspiration. Thanks for all the great tips. The blog and website are the best. The Cotton Candy quilt is so cute! Thanks for a great giveaway! I’ve been a follower on Google Reader for quite some time now. Keep up the good work! I love the sneak peeks of new fabrics and patterns. Thanks so much for all of the great inspiration! Thanks for the giveaway too! Happy Anniversary! I don’t have a blog, so only one chance to win for me but I’m feeling lucky! I LOVE your blog– I love your fabric and seeing it used in your patterns. I read your posts and feel inspired to not only use things you created, but just to be a more creative person myself. Thank you! You have some great giveaways, they are all wonderful. I have blogged about them, plus added you to my blog roll. i love being able to see the different fabric collections made into quilts that i would love to own! and now you are on my blog roll! OH WOW! I wonder what charm packs and little patterns there might be!!! Oh, the suspense! oh, and you’re on my blogroll via googlereader! Love the fabrics and love your generosity! What beautiful quilts i would love to be entered in this Giveaway for a chance to owe such beautiful work, it would also be such a inspiration to own one so i could look at it when i am trying to do my own work, i am very much a novice quilter so it would be great to win. What a fab giveaway..please count me in. What a great post. You are so inspirational to all of us out here who follow your blog and buy your books. Congratulations on your anniversary ! I really enjoy reading your blog! Thanks so much for the great giveaway! I have you on my blog list. I love Wildflowers and can’t wait till it is available. Seeing quilts made with different lines is my favorite thing. Well, my binding has improved immensely because of your blog but, in my humble opinion, you are a great source for inspiration. 3 entries for me! Yay! I have enjoyed your patterns for about as long as you’ve made them. The first I remember making was in AP&Q around the summer of 2001 (I made two of that one). I love when you post pictures in lots of different colorways; photos like that inspire me to try new fabric choices. (And the pictures of peaceful Minnesota lakes bring back happy memories of childhood growing up in South Dakota.) I blogged about the giveaway and have had you on my blogroll for months. Thanks! I always love looking at the way you coordinate fabrics togather. A real weakness I have— your colors always seem to be pieced together in great combinations. Thanks for your generosity– throw my name in the hat. I too love April Cornell’s fabrics. I didn’t realize she had a book out though. This is the first time I’ve been on your blog so I guess learning about the books and different patterns are what I’ve learned most from it. I’m going to bookmark your site and I’ll be back to look around some more! I really appreciate all the inspiration you provide. Your color choices and fabric combinations really help me when I’m feeling in a quilting rut. Keep up the wonderful blogging!! Heather: I love your quilt designs and the beautiful choice of colors that just make them sparkle! I would absolutely love to win any of your giveaways! I’ve enjoyed hearing about your new books…I just ordered the Stop, Drop, and Roll one. And I like seeing all the things you can do with a pattern with various fabrics! Just posted about your giveaway!! I am already subscribed to you via Bloglines and am adding you to my Blogroll so others can click on your link. Thanks! Congrats on your one year blogiversary. I believe this is my first visit and I love your blog. I have added you to my blog roll and I will definately be back to see more. Thanks for the opportunity to win either of these beautiful prizes. I just LOVE all of your quilts! As a new quilter, my mom bought me two of your books–I am making a table runner! I would so love to win one of your actual quilts! Thank you! What a wonderful giveaway! thanks so much for the chance. I love seeing your patterns and wonderful fabrics as well as the machine quilting. I’m always looking for new ideas. I forgot to mention that your blog is on my blog roll. Thanks again for the chance. Congratulations! Your designs and quilts are out of this world…just wonderfull! Thank you for a change to enter your great give away. I will be so happy to win and own one of your gorgeous quilts. I have added your blog to my blogrol. Thanks for a great binding tutorial too. What a generous giveaway. This is my first time here, but will definitely be back!!! thanks for the chance to win. I love your patterns and your choice of colors! Congratulations on your first blogversary! I’m new to your blog, but have enjoyed it immensely. I’d say what I’ve learned the most is how to become more comfortable with different color combinations. Choosing fabric always causes me anxiety! I love everything about your blog! Happy Blog–iversary! You marry fabric, photos, & words so well! Keep on creating! Oh my gosh! You are so sweet to give away your gorgeous quilts, and I am so glad you blog because I love your blog! Happy Blogiversary! I just love seeing what you are working on. Your fresh colors and fabrics never fail to brighten my day! Hi Heather, I recently found your blog and came back to see what you’ve been working on and found your oh so generous giveaway. Who wouldn’t want your beautiful quilt, it’s gorgeous. I hope I’m the lucky winner of any one of your gifts. I’m going to blog about your giveaway and add you to my blogroll of designers. I found your blog through Canton Village Quilt Works and it’s great! I will definitely be back! I really enjoy seeing the different fabric combinations you use in your patterns – amazing how a different fabric combo can make a pattern look completely different! I love the happy colors of your fabrics, and have really enjoyed doing your Little Charmer patterns — table runners from the LC series were my gift last Christmas to friends & family. Also love the cupcake, with sprinkles to match the table-topper!! What a lucky little cupcake princess! I am hoping I can do this all with one posting, rather than cluttering up your comments with 3 separate ones. My blog is All Decked Out (www.imalldeckedout.blogspot.com), and you are on my blog roll!! Happy Blogiversary! I’ve just started quilting and you’re blog has given me so many ideas and tips! First, I gotta tell you how much I love your new line, Wildflowers. I love the use of vibrant red, brown, and yellows. It is so cheerful! I appreciated your blog back in February talking about Moda pre-cuts. I love all your ideas and tips regarding their uses and tips on seam allowance. I always wondered where I need to align my seam with the pinked edges. I just discovered your blog about a month ago while I was quilt blog hopping. Your use of color pulled me to your blog. I love seeing what others do with color too. Hi, I’ve been reading your blog since your first post and I love it. I enjoy seeing your quilts, your colour combinations are inspiring and would like it if you did posts on how your choose your colour combinations. I also enjoy seeing photos of your home. You’re been on my blog roll since I started blogging at the beginning of June. I have enjoyed your blog for quite awhile. My favorite thing is seeing the pictures of your completed quilts. I have one of your tablerunner patterns and am almost finishing making the tablerunner. I follow your blog through my Google Reader. I’ve tried three times to post a comment to tell you that I’ve posted about your giveaway on my blog. For some reason, those comments won’t show up. So, my apologies if you now have four comments saying the same thing! Come on over to http://plainjane21.blogspot.com where I’ve posted about your wonderful giveaway! Heather, love the quilt and table runner. That table runner is on my list to make someday soon. I would love a chance to win any of these nice prizes. I enjoy reading your blog. I am a newer follower on your blog, and I really liked the pattern you posted during the blog hop in June. I also enjoyed the trunk show you did for Northern Material Girls in St. Paul this month. I always like to hear how women start a business. I love your quilts and patterns. I really like that you preview your books. Often I look at a book for sale and think that maybe I’d make 1 or 2 quilts from it but from your previews I can see that there are many great patterns that I would love making. Please add me to the list of those who want to win your great giveaways. I mentioned your blog in my blog however I do not know how to make it so others can click on it and get to it. I’m rather new to this blogging thing but really enjoy getting inspired by all the great quilters all over the world. I also bookmarked you so I can come back and see what new things you do. Thanks for the inspiration. I would love to be in your drawing-I’m just drooling over your grand prize-one of my favorite fabric lines in an absolutely gorgeous quilt! I would love to be entered in your give away. I’m not an accomplished blogger, but sure do love surfing. I found your site through Canton Village Quilt Works. She has a great blog as well. I have mentioned you on my blog and added you to my wonderful web or blog sites to visit. Thanks! I am adding you to my bloglines…. I actually liked learning about your pattern books from your blog, as a result i have purchsed 3 books. I like the fact that you sometimes show the one pattern in more than one fabric range/color way. Heather, I really bliked the before and after series on the how. I also love looking at the quilts. I have had you on my blogroll for awhile now! I just love looking at how beautiful the quilts are finished off and the lovely colour combinations used, I wish I was that talented. I love your blog. I really enjoy it when you show us tips and tricks of the trade. (like the one on binding and which needles you us….i ordered my straw needles that day and have used them ever since). I also love it when you show us your beautiful home and your quilts displayed in it. You really are talented Heather and your blog is a pleasure to read. Oh yeah, loved the series on when you first bought your home and all the adventures from that. I really enjoy your blog! I loved seeing your home remodel. Absolutely love seeing all your quilt creations. And I have used your technique for cutting bias binding over and over agin. Love it! I visit your site for inspiration and you never fail to deliver! I love, love, love your site! Happy blogiversary! Your quilts are gorgeous and I would LOVE to win one (or the patterns). My blog is very sadly neglected, so I’m going to leave it at one entry. Someday I’ll get as good as you at blogging! P.S. – Have we seen the table topper next to the celebration cupcake? It looks pretty. Love this giveaway!!!! Thanks for the chance to win! You are on my blogroll already! Thanks for a second chance to win! I enjoy your choices of fabric and patterns. Your quilts are a real inspiration and I love your books – I have the honor of owning quite a few of them! I also enjoy feeling like I’m geting a peak at the inside of the quilt industry – from the designers side. Heather it never ceases to amaze me as to how much you get done. You are really gifted when it comes to color. I like seeing a design sewn with different color’s, it is unbelievable as to how the same pattern changes with different colors of fabric. The tips you have given in the past year have been so easy to follow, Thank you for that. I would be honored to win a give away you have sewn, you do wonderful work. Wow. What a generous giveaway! I just like to read about all the different projects you’ve been working on and the pretty fabric lines that you design. Love them! And it’s been blogged about! Love that quilt, it would have a loving home with me! I love seeing your quilts but also loved seeing your knitting. The sweaters were beautiful. I also quilt and knit but not as well as you. Thank you for the opportunity to win one of your quilts. I don’t have a blog. I just read lots of them. A great way to see new ideas. I have all of your books and have learned so many tips from your blog! I love seeing the quilts done up in more than one fabric line as well. I would love to win one of your quilts! Happy Happy Blogiversary! A year and each day I’d guess the number of readers increases. Thanks for spending some of your cherished time with us! I look forward to each new post. I’ve reread a number of them! Happy Anniversary! i love your books and really enjoyed your binding tips. I really enjoy binding a quilt – one of my favorite things to do! I always look forward to your posts. I started reading your blog earlier this year & it’s become a favorite! Your pictures are great & I always like to see your current projects. Thanks so much! You’re on my blog list! Wow what a fabulous giveaway! I would love to add you to my events blog– http://www.blogeventsdex.blogspot.com Do you have an ending date that I could list? Thanks! You’re on my blog roll ~ you’ve been there for awhile. I don’t know if I’ll have a chance to blog about you before my trip so I might only get two entries. I love all your posts ~ especially the one about Daisy. That was my favorite. All-time, absolute, numero-uno, primo-first F-A-V-O-R-I-T-E! Blog ideas ~ more Daisy posts. More Daisy pictures. Kids are cute ~ and you’ve definitely got a lot of gorgeous kids in the family, but Daisy has character… personality… paws! This is crazy, but I loved seeing your house remodel. I don’t know if that was in the last year; I enjoy your blog and have read all the blogs back to the very beginning! LOVE, LOVE, LOVE the quilt. I so hope I am lucky! Wow Heather, I love it and I’d love to win it, any of it actually..lol! Hello again! I’ve added you to my Blog Roll of fame! Oh please enter me into the giveaway. I do not have a blog but really enjoy everyone elses. I made a quilt with the blue and yellow fabric and I agree that it is so cheerful. Love reading your blog. Especially about all of the quilts you get done. You really inspire me. Oh Heather — I would enjoy any of those wonderful prizes. Hum, I think I saw your book Sizzlin’ 60s on your site and fell in love L-O-V-E with it. I am almost done with one of them. I like seeing your new designs. So count me in for a chance to win any of these great prizes. Oh yes, I did enjoy seeing your finished knitting projects. I love your photos! I am a big fan of your fabrics and patterns. I would love to hear about your design process. I also love your house, paint colors and how you have your quilts displayed. Happy Blogiversary! I’m so glad you are blogging and really enjoy your pattern. Thanks for the great giveaway, and for sharing your work with us in your blog! Another entry for me – you are on my Bloglines list. I love seeing your patterns and how different fabrics can change them. It makes me look at patterns with a different eye! I also loved seeing all of your knitted projects! Made me wish I had more time! You are on my blogroll! Happy belated blogiversary! I really enjoyed seeing your home renovations. I also used your tutorial on hand binding. Thank you for your wonderful patterns. I have added you to my blogroll. I just found your blog site–and I love it! Thanks for the giveaway, they are always fun. What amazingly gorgeous quilts! I would love to be included in your drawing. And be honored to win one. What beautiful fabrics and quilts! I really love the new line you gave a sneak peak to. Red and aqua!!! Ahhh…. I am sorry to say that I just discovered your blog thanks to Dandelion Quilts blog. I have added you to my Google Reader subscriptions and look forward to going back through your posts to catch up. Definitely going to have to look for your book and the new Wildflowers fabrics once I can spend money again! What did I learn? I learned that I probably don’t want to do a major remodel on the house. LOL!! I loved that toilet story. I would love to enter your giveaway. I love your patterns. I enjoy your style of writing as well as the photography of quilts which inspires me to run home to my sewing machine. I refer back to your useful techniques often–the technique for putting on binding without a lump–is my favorite. The models on your blog are quite lovely! Soon there will be more little models to add to your shoots. Your creativity and enthusiasm amaze me! I think I am too old for a blog. Congrats on your Blogiversary! Love reading waht you are up to! Your blog is one of my “must-reads” every day I’m on the computer. Though I love looking at your projects, hearing about your books and fabric lines, I sooooo much appreciate reading about tips/tricks and tutorials. Those are the things that will help make me a better equipped quilter. It’s also a little peek into how your mind works. I also loved seeing how you get ideas then put them to paper then to reality. That was a really fun post. Thank you very much for giving yourself to this blog project. WE ALL APPRECIATE IT!! I love your patterns and your fabric choices. Thanks for your blog. Your work is beautiful! Thank you for the opportunity of winning an original Heather quilt! You have been on my blog list for quite some time. And, I will post your give away on my blog shortly. Thank you for being so generous! Hello there! I only found your blog a few months ago. I really like this inspiration I find here. And your photos, they are great! I like the cupcake photos on this post. So. Cute. Heather, I enjoy all of your posts. I like seeing your beautiful fabrics, your great quilts, the neat valance, striped bindings, tutorials. Thanks for sharing. I love your blog. Your color choices for quilts are what I love the most and, of course, the patterns too. And I enjoy seeing and reading about the remodel of your home. Our home is always changing and now we are building so I like to see what others have done. Happy 1st Blogiversary!! I’d love a chance to win one of your quilts, particularly as I have ‘the book’ 🙂 I’ve been visitting thru other blogs, but am definately gonna add you to my blog roll… here’s hoping I’m a winner! What fun filled days you have! From your fabric % quilt designing, to your trips & teaching…. I can only dream of it. Happy 1st Blogiversary! I check your blog many times in a week, looking to see what’s new. Great Job! Love your blog, patterns, books, fabric, and just about everything you do! Happy blogiversary!! What an incredibly generous give away! I love the cheerfulness of April Cornell fabrics, and the various different colour options you show. I first found your blog last week prior to your trunk show at Northern Material Girls guild. I love your patterns and I’m excited to try the Little Charmer 5 patterns. Thanks for creating such beautiful works of art! oh, and I follow your blog, too! I don’t have my own blog, but I read love reading yours. The before and after pictures of your home were great. Thanks for sharing. I love all your blog entries…honestly. I especially like to hear about all the “behind the scene action”…new books, new products and the like. I used your tutorial on binding inside seams just the other day and it worked perfect. I have had you on my blog roll at my website ever since I put up my blog…in fact you were the first I listed! I found you on someone’s blog roll and so glad I did. I’ve bought several of your books this past year and have gotten 2 more friends that are hooked also. Love your colors, your quilting, your books, your inspiration…..keep it coming. 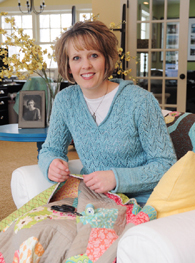 Would LOVE to have one of your quilts…..keep up the great work, Heather! You are a wonderful artist and teacher! Your patterns are the greatest. I especially enjoy your tips about products you find useful, where you get your inspiration…the list goes on. Keep up the good work! Thank you so much for the chance to win one of the giveaways. I love visiting your blogsite. I like seeing how you put things together and it always seems to look great. Oh my goodness, what beautiful quilts and you want to give them away. Takes my breath away just thinking about it. I have learned a lot about using fabrics that are not in my comfort zone. And I love seeing what you are planning for future books. Keep up all the inspiration. I love your books and fabrics. Just keep sharing your designs and we’ll all drool. Please enter me in your drawing. Congratulations on your blogversary! I posted on my blog about your giveaway. Please enter me a second time. I’m new to your blog but not new to your patterns. Love them. And I met your husband in Portland Quilt Market(he won’t remember, of course, but my husband is also from Minnesota…). I first came to your blog to find the pattern for Shooting Stars when it was in the magazine article about you. I also made the quilt that was in that magazine and am currently making the Sizzlin Sixties quilt that is on the cover out of reproduction fabrics. It is challenging but I can’t wait to see it done. Thanks for everything. I love your designs. Wow! Gorgeous quilts! How generous of you to share them.Looking forward to viewing your next book and making some of those quilts, too. I have almost all your books!! I love all of your fabric lines, can’t wait to see the new one in the quilt shops. I did post about your giveaway on my blog. I tried sending this before, but I’m not sure it will take three comments. I love your blog as it is always interesting and your photos are great. One very talented lady. Thankyou for entering me in your giveaway. I have you on my blog roll. I’ve just blooged about your giveaway. Some people are going to be very happy & lucky! I just love seeing what others are working on. It’s so inspirational. I really enjoy the variety in your blog – family posts, loved the stories about rehabbing the house, and especially the sneak peeks about what is coming. The advance pictures of your fabric lines are really mouth-watering! I enjoy it when you show a quilt made in different colorways, it inspires me to branch out and be more adventurous. Happy Blogiversary! I enjoy seeing your beautiful quilts, the remodel progress, and the helpful tips. I think I have most of your books and would be honored to win one of your quilts!! Quilts, quilts, quilts…. love your stuff! Would love to be entered for a chance to win… what an AWESOME giveaway. Happy one year blogiversary. I hope it’s not too late to enter! I so much enjoy your fabric choice and your use of color. Most of all your enthusiasm for the craft. I find your blog very inspiring! I’d love to learn more quick/easy sewing projects… gift ideas, that sort of thing. I enjoy seeing your fabrics, your ideas, your new designs, plus your family and home. Your work affects your family and vice versa, and it’s all part of the picture of you & your creativity. Keep up the good work, and hopefully I’ll be a winner. Your blog has been listed on my blog for months. It’s a favorite, and I’m always glad to see a new post from you. Well I just found your site. I can’t wait to explore it and learn new things. happy blogiversary. I hope I’m not too late. Your blog is pure inspiration to me as a new quilter. I would be so happy to be skillful enough to make even half of the quilts I have seen that I want to make. There is so much beauty on your blog, both in your quilts and in your home. Thanks for sharing. Happy Blogiverary! I’m a somewhat new reader and just love your blog. As a transplanted Minnesotan, I love the photos you share of our home state. Some days I miss living there and your photos help ease the homesickness. PS: I have you in my Bloglines subscriptions. Does that count as being on my blog roll? wow–I love seeing your color choices. I’ve also added you to my blog roll. Thanks for the chance to win. I have now posted about this contest. I’m not sure how to add someone to a blog roll though?? I cannot name any one particular reason I like your blog. It is just a good all around blog. I enjoy the tutorials, the quilts, the house renovation, the scenery. All of it. You have been on my blog roll ever since I found your blog. Which was August 27th 2008 and I just had to skip out of work and drive 1/2 hour to get one of your books. And for my third chance…It is a good thing not too many people read my blog..because I posted about your give away..but I really don’t want to tell others…I want to win..I’m like that you know. Wow, beautiful quilts….I love the yellow and blue one best! Congrats and good luck all! Gorgeous Quilts! I would love to win! PS – I am a follower of your blog. Happy Blogiversary! I just found your site recently so I need some time to go explore the rest of your site and find out more baout the house renovation… but, since I found you I’ve most enjoyed seeing your new fabrics. And, I LOVE your photography! Congratulations on the anniversary. I love your quilts. I like looking at them and especially seeing how they have been quilted and the color choices. I love your tips. Happy Blogiversary!! You are so generous giving away a quilt. If I win the “cotton candy” quilt–I will give it to my 30 year old son. When he was 6 he wrote a song called “Cotton Candy” and sang it at the school talent show. I will never forget how cute he looked. He made fake pink cotton candy for his prop. Congratulations. I love seeing all the quilts you make. This is my first visit to your blog. I got your blog address from “Cats on my quilts.” Reading some of your past entries I know I will return to read more! I love to read about what other quilters techniques, tricks and choice of patterns & material are. In fact, I read so many other blogs I haven’t time for my own blog. I started reading your blog as part of the blog hop…but have gone back to read previous ones…my favorite thing is the ease of your patterns and how you put the colors together…I can hardly wait for your new line of fabric to be in the shops…. This is my first visit to your blog. But I’ll be back. I have some of your books and they are big sellers at the Cotton Patch in Tulsa, Oklahoma where I work part time. I posted about your give-away on my blog. I added you to my blog roll. Good luck to me! Hi Heather, I’d love a second chance to win. Here’s a link to my post about your giveaway. Oh my! Can I join in?? You know I love every single thing you make. Too much talent for one individual, that’s for sure. Can’t believe its been a whole year since you started blogging. From one hermit to another, I’m sure glad you did! Hey, I’m officially the mother of a teenager today, and sent the others off to their first day of school… I love, love , love your books, your talents, your quilts… and I’d love it to be my turn to share in the fun! Congrats on your blogaversary! I just love your grand prize and your color palette. I think your choice of fabric is what I have enjoyed the most. While I am not a quilter, my mother has quilted for over 65 years. I am her caregiver and she can no longer quilt. However I share her blog with you as a kind of therapy. Mom was just a simple quilter but she loved it. Thanks for sharing your joy with us. Hi Heather, I’ve put you on my blogroll. I learned some binding tips. Thank you for sharing your experiences! Love, Love, Love your quilts!!!!! My neighbors would hear me squeal if I won. It would be so much fun to win one of these – please toss my name in the hat, please! I just found out about your blog, so I can’t really give you any comments about what you’ve been blogging about. I do love the projects that you’ve made! Wow. 500 and something comments already! Oh, if I were so lucky to win…First of all, congrats on your blogiversary. I love your blog and you are and have been on my blog roll. I truly enjoy your blog/designs. For my second entry, I want to tell you why I love your blog. You are an amazing pattern designer and I love to see all of your pictures of your designs. I especially like to see them in the setting of your beautiful home (inside and out.) I even loved seeing your booth at market. Basically anything to do with decorating and quilting is what grabs my attention. Thanks for the giveaway! This is the first time that I have been to your blog. I was visiting Camille’s blog and she said that I should check out Heathers Blog. So here I am and you are added in my favorites! I will be visiting often. I love your colors that you select for your quilts. Sometimes I think that is the hardest part, but also the most fun! I love everything about your blog! Your beautiful fabrics and your inspiring quilts…I want to make them all (and have each and every one of your books! )..currently working on a black, red, and white Gypsy Girl. Your hints..like for binding…have been so useful. I drool over the sweaters you make, and wish I could knit. And I love the photos of your family…those precious nieces and nephews! And of course Joel and his dog. Your site is such fun, Heather. Congratulations on the anniversary! I love the way you include different color options for the finished quilts. I liked most, the binding trick! What a good one,I am very glad that I spotted that one. Enjoy your pattern quilts, as a beginner they ARE beautiful. I did make a quilt called Majectic Mountain, I’m kinda proud of my accomplishment there. surprised even myself!! How kind are you to do such a fabulous giveaway! I love the quilting in your quilts! I’m here for the first time today from Simplify. The quilts look amazing! What a generous giveaway! ooops! I forgot to leave a comment about what I liked on your blog. I would say that I’ve used your binding tutorials more than once so I would deem them quite helpful. You can combine this comment with my first one. I am new to quilting and your blog gives me great ideas especially binding!! congrats on a year blogging. I’m just getting into quilting and your quilts and patterns are beautiful inspiration. I love to look at the color combos to figure out how to do my own. I got here through Camille Roskelley’s blog. She made me love quilting. You certainly have a gift for quilting. I would love to be put in the mix for any of those great prizes. I’m going to put you in my blog reader now. Congrats on the blog-i-versary. Your blog is a true inspiration. Keep up the good work … I love reading it. WOW! What an awesome giveaway and congrats on your blogiversary! I was actually led to your blog from Camille’s blog, Simplify so I havent had the chance to browse just yet but WOW, beautiful pictures and quilts! I cant wait to read on! I hope I win something special!!! i haven’t started quilting yet, but all these blogs are very inspiring! thanks for the giveaway! 509! I can’t believe I am number 509!! Yea me! You have beautiful photography on your website. I enjoy looking at your quilts and patterns. I just spent an hour combing your site, drooling and learning. Fantastic! Oh!! And I added you to my Bloglines! What I have learned and loved? I am awe inspired by your talents, and was inspired to begin quilting 🙂 and will soon try your binding idea, I have a lot to learn though…it would be an absolute honor to win! Best thing about your blog is just inspiration. I love visiting your blog and seeing all of your creativity put to work. Great giveaway and happy anniversary. Today is my first visit but I’m adding you to my reader. Beautiful quilts!! Your generousity is unbelievable. What a joy it would be to win. I will be adding you to my list on Google Reader to keep up with your news. I’ve never commented on yoru blog before, but I love that inspiration is everywhere! It is full of life and energy and is always a treat to visit. What beautiful prizes, and such an awesome giveaway. I love all your patterns especially those little charmers, they are all so cute!! I loved the house renovations and seeing all the quilts. Thanks for a wonderful site! I love seeing anyone new ideas, I need someone to jump start my mind! I love seeing new fabrics and the way they’re used! I find your patterns, fabrics and tips enlightening and encouraging! Thanks for the chance to win! Great site! Thanks for the tutorials. Pick me! I would love to try one of your patterns! I love you blog! I’m looking forward to your new book. I’ve loved seeing how your quilts contrast color value. That’s been a big struggle for me to get my quilts to pop more and yours have been really inspiring. Thanks! Happy Blogiversary! Love your blog. Love your quilts. Love your creativity. What an awesome giveaway! I have to say my favorite things about your blog (besides the quilts) are the photos of your home. I just love to see your decor and how you actually use your quilts everywhere! Thanks and congratulations. I find everything on your blog from patterns to fabrics and tip, enlightening and encouraging. Thanks for a chance to win! I enjoy quilting tips and tutorials. Sometimes you just pick up something new and fun when you read tips. Love your designs and your fabric choices are always gorgeous! I’m a relative newcomer to your blog. I have seen your work many times in the quilt shops and from others’ blog. What has impressed me the most is how “real” you are. You give me inspiration and hope that the regular, ordinary quilter can master any skill and turn out treasures from the heart. Thank you for the motivation! I mostly enjoy all of your tips and seeing how creative you are with all of the fun fabrics! Love it all! Yahoo for contests! Those quilts are BEAUTIFUL! I just found your blog through Simplify (she posted about your giveaway) and I love it! Can’t wait to read all about your designs. I clicked back on some past posts and I am excited to learn from you. Now we will see if I ever get around to actually doing any of the cool things I read about online or just keep dreaming about how great it would be to do them!! I just love seeing all the fabulous projects you are up to. You make amazing things! What fun giveaways too. So exciting! I love your blog! I check it daily! Your photos are awesome, and I love seeing all the quilts and fabric! It’s inspiring and so motivating! Thanks again! and I added you to my blog roll so please give me all three entries!! I blogged about your fabulous giveaway and added a link! And, yes, of course you are on my blog roll! I love your site and all your quilts. I especially appreciate the color options you post. Sometimes when I see a quilt in one color, I think it can only be done in that color. Keep up the great work. I love your blog, it is inspiring and love the renovations on your house. Your quilts are beautiful! Oh! What a beauty! 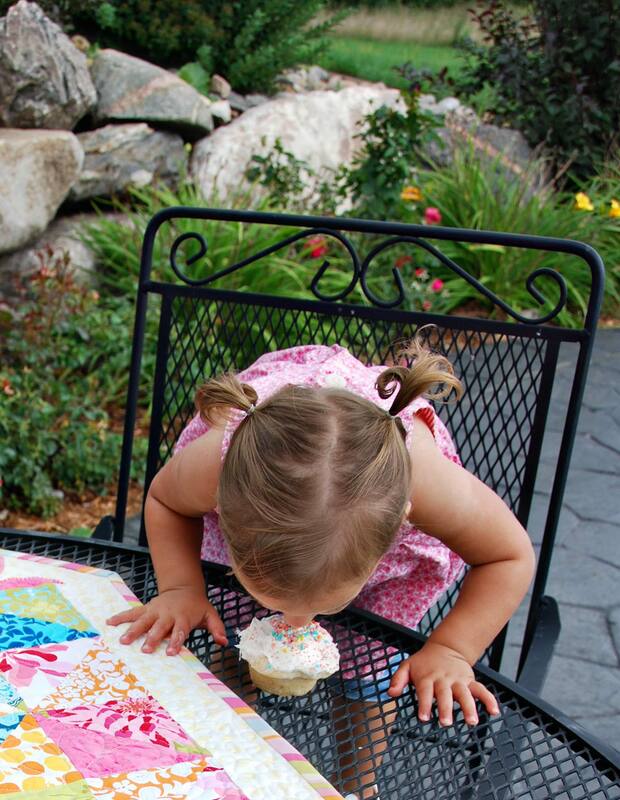 The quilt, the cupcake and the cutie pie eating it! Could me in. I’m off to blog about the giveaway! So pretty!!! I would love to win! I just found your site from Simplify but I immediately discovered that I already own a few of your patterns! I am excited to learn more about your design process and how you choose the fabrics that you want to use. Thanks for a great opportunity to win. Your quilts are stunning! Wow, your quilts are beautiful. I just found your blog and I’m looking forward to exploring it some more. What do I love best? Photos, photos, photos! All your work is so inspirational! You are so talented. I really like the examples of quilts in different color schemes, I have a hard time choosing something if the example doesn’t have colors I prefer. It helps to see how I can make the finished product into something I really like. Love your quilts, so pretty! Congratulations. Love the cupcake face. I have only just found your blog courtesy of Twitter – I look forward to exploring it – I have almost everything that you have written & love it all! I don’t have a blog roll – whatever that is, but I will post your link on my facebook page – does that count? The quilts are just beautiful and would be amazing to win! I follow you regularly on Google reader and love the pretty things you make! I just started quilting in January and you have INSPIRED me…I’ve done 10 quilts so far. I’ve learned so much about how to use different free-motion designs (I even took a class as LB Quilt Festival). But, the BEST post you did by far, was showing off your studio!!!!! I moved everything around and my dear hubby even moved his office out of OUR office and now it’s all mine. So…THANK YOU!!!! Happy Bloggiversary! I just learned of your blog from Camille, author of the Simplify blog so I haven’t had the opportunity to read all of your posts for the past year. However, I can give you an idea of the things I like in the blogs I follow. I love the inspiration I get when I’m reading about other’s projects. Whether it’s through pictures of the project(s) or a tutorial on a new technique, I just find it inspiring. For my third entry, I have added your blog to my blogroll. Thanks! You inspire me in my quilting more each day when I read your blogs. Could I be so lucky to win! Hope so! It will not allow me to put a link in my comment, but I did post on my blog about your Give-Away. Thanks! Wow, what a giveaway! Thank you very much! I don’t use blog roll, but I’m putting your blog on my google reader right now — you’ll have to take my word for it. 😀 Thanks for counting me in your giveaway. You’re so generous! Here’s my comment … beautiful quilts!! I posted a link on my blog so others can enter the giveaway too. I love the overall style ideas! Even though I adore the quilts, it’s fun to get a peek into backgrounds & paint colors and overall palettes that go together so nicely. Thanks! I just found your blog so I am a new reader but am looking forward to going back and reading future entries. Thanks for the chance to win. i actually saw a link to your blog from my friend. i think i’m going to love digging in and seeing what all you’ve posted your first year! happy blogiversary! I’m new to your blog, but I love your patterns and I’m glad to have you added to my reader! I just found this blog, I love your patterns they are so much fun! Can’t wait to see more! I thought I was the only one out there reading your blog and you were writing just to me. Oh well! You seem to capture the wonder of quilting. You inspire me to be a better quilter. You show me colors and design and how they work in quilting. Thank you for sharing your knowledge and art, even if it isn’t just with me, but the world. Your quilts are inspiring. Makes me want to make one of each but I a, much too slow, winning one would be a lot easier. Keep up the inspirational work. Heather, first of all congratulations on your blogiversary. As for what I enjoy most about your blog, well that’s a really tough one…I of course love all the quilting posts but I think I really enjoy those little personal snippets the most. The one about remodeling your house (or should I say rebuilding, LOL) and when you featured your dog for your hubby I loved it. Things like that leave little footprints all over my heart. Don’t change a thing. OH! of course, the giveaways are nice too and wow, this one is spectacular, thanks for your generousity. Good luck to everyone. Happy Blogaversary!!! I just foung your blog and can’t wait to dive in!! Wonderful giveaway!! I just added you to my Google Reader 🙂 What a terrific giveaway. Happy blogoversary! Happy Blogaversary! I have been following your blog for awhile and I love to hear about your new designs coming out and seeing them done. I also loved your home renovation story :o) Would love to be entered in your giveaway. Such beauties! Would love to snuggle up with any of them! Thanks for the giveaway! I love your tutorials and tips! I am new to quilting and I find the tutorials with photos are invaluable!! wow! GREAT prizes for a blogaversary! I love the color options! It always amazes me how a quilt can look completely different with different fabric choices. Lovely quilts and fabulous give-aways. You are on my blog reader. I don’t know where to begin. I love all your work fron the older days with using lots of black fabric, which is really striking! Your new books and patterns which I’m sure I oun most of are so fun. The colors are happy and make anyone want to make your quilts. I made your Gypsy Girl quilt last year with you new line from market last Oct. it was beautiful. Your quilts put a smile on my face, thanks. Thanks for the generous giveaway! I just came to your blog for the first time from Camille’s, but I can already say that I’ve enjoyed looking at your tutorials. Aall of this blogging is new to me. Your quilts are lovely and inspiring. The blue and yellow is just summer personified!!!! I appreciate seeing unusual color combinations…dramatic is goo. Happy Blogiversary! Blogging is such a wonderful way to meet new people and learn new crafts. As a hand dyer, I have to say that I love your color choices the best. I just enjoy looking at your work and being inspired! The colors in the blue and yellow quilt are very appealing. You do lovely work! ooooeeeee…. i’d love to win! i would love to see easy yet traditional quilt patterns and tutorials. and i’m adding you to my blog list! Love to see how you use the different colors/ fabrics in your quilts. This is my first time to your blog- I heard about it from Stella Bella Quilts blog. Hope I win!! I love your patterns and will spend some time now reading your blog. Thanks for the chance to win!! Your quilts are beautiful! I love the fabrics you use and I visit for inspiration. just found your blog. love, love, love your quilts. love all the great color combinations. Thanks so much. I love looking through your kits. Happy 1 year! I love your color combo’s. I’m new to the quilting world and Im trying to make a quilt for my little girls room. Lets just say Im struggling picking out fabric!! I love seeing what you have put together. There are pieces you have put together that I never would have thought to do but look beautiful. Happy First Blogiversary! I’ve enjoyed seeing your fabric and quilts, of course. And especially like seeing the quilts done in different fabrics. Also, your tutorials have been helpful. I was especially excited to find the one on cutting continuous bias binding. Someone had shown that to me several years ago, but I couldn’t remember how to do it and was unable to find it anywhere on the www. So thank you especially for that tutorial. The other two on binding were also helpful, especially your technique for joining binding. Good luck with your deadlines! Love the quilts thanks for a chance to win. Your quilts are beautiful. It is always nice to see a pattern shown with more than one choice of fabrics. oops – I re-read the rules and realize I need to comment again to say that you’re on my blog roll. …and a third time to say that I blogged about the giveaway! Hi Heather! I love the tutorials. I’ve always loved quilts, but I was intimidated by the how complicated the quilts looked to make. I’ve been taking a quilt class at a local store here in Vegas and I am amazed at how much I love it. Now when I look at the quilts, I look to see how the squares were put together and I can totally see it now! I love this!! I’m off the put you on my blogroll. I usually click on you from Camille’s site. Thanks so much for the generous giveaway! I love how the intricate quilting in the white space brings out the great colors even more! I dont know where to start – loved it all, and I guess you probably have heard that over and over!! I loved the tutorials, you did them so well, and pictures were great – loved renovations to the house and your view of why you bought there, was divine. I also thank you for sharing your family with us. Each and everyone is precious!! Thanks for sharing your love of knitting, it was very inspiring to me. Thanks for always sounding upbeat, even when I know you must be in a rush to meet deadlines. PS: Hope I win, but if I dont, I’ll keep coming back for sure!!!! Hugs!! I have to confess I just found your blog from Camille. But I love all the lovely colours you use (I had to stop by and visit!!) and I’m definitely adding you to my blog roll. I’m hoping that gets me two chances because I’D LOVE TO WIN. One of those bright summery quilts needs to come down south here to chilly New Zealand, just what I NEED to counteract the late winter cold! Happy blogiversary! Everything about your blog is inspiring. And sometimes I just need a little inspiration to get me going on my own projects! I would like to win very much! I am super new to quilting and have only made one of any consequence at all. I would like to know how you come up with ideas to use your fabric (especially if it is memorable fabric like maternity clothes) so you get the most pieces out of it. Hope that makes since. I’m not very crafty, but enjoy browsing your blog. Your links, like those in your fabric area, have led me to some good ideas for gifts for my sister, who IS a quilter. Thanks for the giveaway!! I found your blog awhile back, and promptly ordered two of your books! They are amazing. Thanks for your inspiration. Happy blogiversary! I have owned and used several of your patterns and books, but I just discovered your blog a couple of months ago. I love seeing all your projects and how you wonderfully combine colors. Now that I’ve read some of the other comments about your remodeling, it will be a must to go back and look at your earlier posts as soon as I have time. What a generous set of prizes! I would be thrilled, thrilled, thrilled to win one of them. I added you to my blog roll! I look forward to reading more of your thoughts! Just found you . . . an instant fan! Congratulations on your successes and best wishes for many more. very lovely quilt. hope I win! I love your tutorials. But I also love the quilts and the fabrics. I’m a brand new reader of not too long, but I love quilting and fabric. Unfortunately, living in Alaska we don’t get the selection of the “lower 48” However, I’m excited (hopefully) to see your newest line in a local shop soon…. I also have you added on my blog roll. Thanks for being so generous! 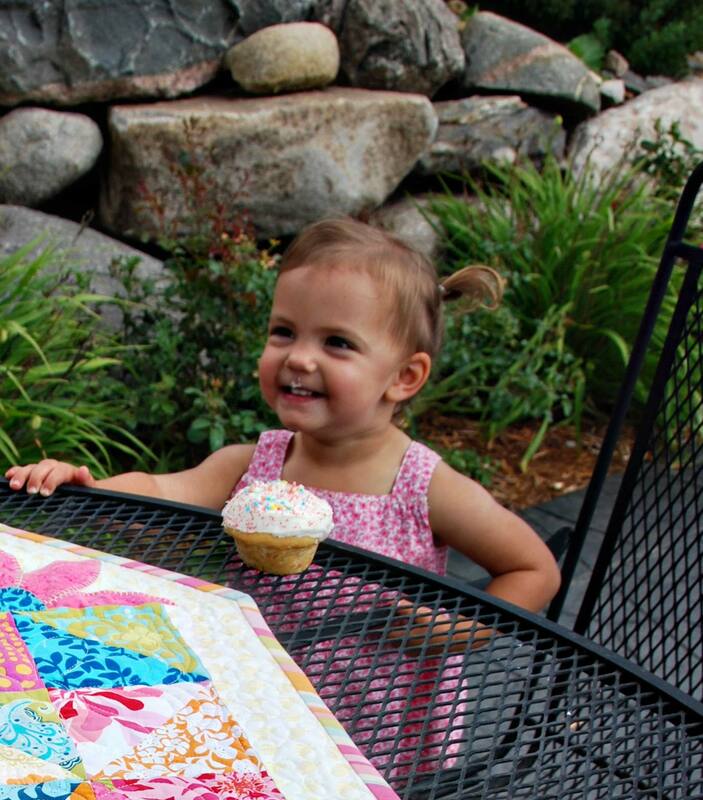 Beautiful quilts, fabrics and little girl! What a cutie, and I love the icing all over! I started following your blog because I love your quilts and patterns, I now also love: your decorating and LOVE your bread recipe. I so appreciate your wonderful ideas and have also enjoyed your knitting. You are so multi-talented! Happy Blogiversary! I would love a chance to win one of your awesome prizes. Thank you for sharing your talents with us. Hi I am a first time visitor to your blog. Happy anniversary. I had and aha moment when I saw your photos of your quilt in the poetry fabrics. I have admired it in your book and am very tempted to make it, but to win one now that would be something!! I love the blues and yellows. I am looking forward to seeing more of your work. I just love to read / see finished quilts, machine quilting, fabric selections, finished projects, etc. Beautiful quilts!! I just found your weblog through the weblog of Camille R. and what a surprise it is!! The fabric is gourgious and the patterns so fresh. I tagged the weblog for the tutorals, they will come in handy. And of course the first thing that catched my eye was the name ‘Mulder’: it is a Dutch name and in old Dutch is says ‘Miller’. Vrolijke groeten from the Netherlands! My favorite blogs are when you tell us about your favorite tools and tutorials for techniques. Your quilts and fabrics are lovely. One day I hope to give machine quilting a serious try. Maybe a tutorial for a beginning machine quilter? I love giveaways and this one is super special. Cute little model eating the cupcake. First – I recognize this quilt patern! Love it! Please enter me and thanks for this generous offer! Second – I blogged about you and your fab giveaway! third – Sew ahppy to add you to my blogroll! As for blog content, I am not much help! I love it all and being a new blogger I particularly enjoy learning a bit about the person behind the blog as well as the inspiration and the fabrics and the quilts and the makeovers and everything else. It is so inspirational to be able to share ideas of what you are doing and realizing other people might pick up on it and get a spark. Likewise it is wonderful to read what is on other people’s minds, be it the kids, the renovating, dogwalking, fabric buying or quilting and find your tastes and attitudes changing because of all the new fresh ideas out there. Tutorials are also great and very much appreciated by a newbie like me but it is you, the person that makes it all happen. My first impression of your give-away quilt was that it makes a person want to smile. It is such a happy quilt. I simply loved your book On a Roll. Keep them coming. Okay, here is entry number three for me as I have now posted about your giveaway! I would REALLLY love to win one of your beautiful quilts! I found you from the comment on Camille’s “Simplify” blog. I’ve added you to my reader of course. It’s a great blog, love the pics and information. 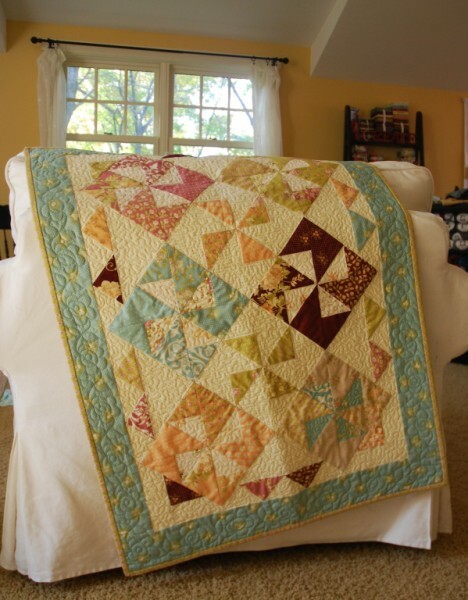 I have loved seeing how you used your quilts and fabrics in your home! I also really liked your tutorial for how to do binding on uneven edges. I hope I win the quilts! Beautiful. And I’d love a chance to win. No blogging for me, so this is mt only entry. I love your tutorials the best! Well, and your photos too! I really just love the whole blog, but I suppose I look forward to tutorials the most! Thank you for this chance to win and Happy Blogiversary!! I’ve been checking in on you for a while now…my favorite posts were about the remodel on your home….I wish I had the guts and money to do that to mine…..love the pics of your studio as well….just getting back into quilting after a spell of knitting exclusively for about 8 years….keep up the great work…it’s inspiring. I really like your binding tips and am inspired by your beautiful quilts and color combos! I love the quilts! Your blog inspires me to create! I LOVE coming to your blog! the pictures are always amazing and the colors, oh the colors. I think I want to live near a lake, even if it freezes over. Thank you for sharing your amazing eye for beauty! As a starting quilter I learned a lot from you. I love your quilts. You have great tips and ideas. Thanks for the chance to win. I just love looking at all your beautiful quilts. I always love ideas for new quilt designs. Even though I may not use them but it gives me ideas of my own. Btw, I love how you add about your famlly – I do that too. I learned from your blog to make the time to make pretty things. Your quilts inspire me–esp. the colors. Thanks for the wonderful giveaway. I love the beautiful colors in the blue quilt. It is just awesome. Thanks to Camille too for letting me in on this giveaway. What an exciting giveaway!! If only I had a blog – I would be sure to mention you…does that count? 🙂 Thanks! I love your tutorials,info of latest pattern and fabric. I also like to see the quilts which were made in different colorways from the sample one. I have loved your patterns for quite some time now and just recently found your blog!! Your quilts are just beautiful! just found your blog today through Simplify. I know i will love reading your blog cuz of your patterns & use of color. 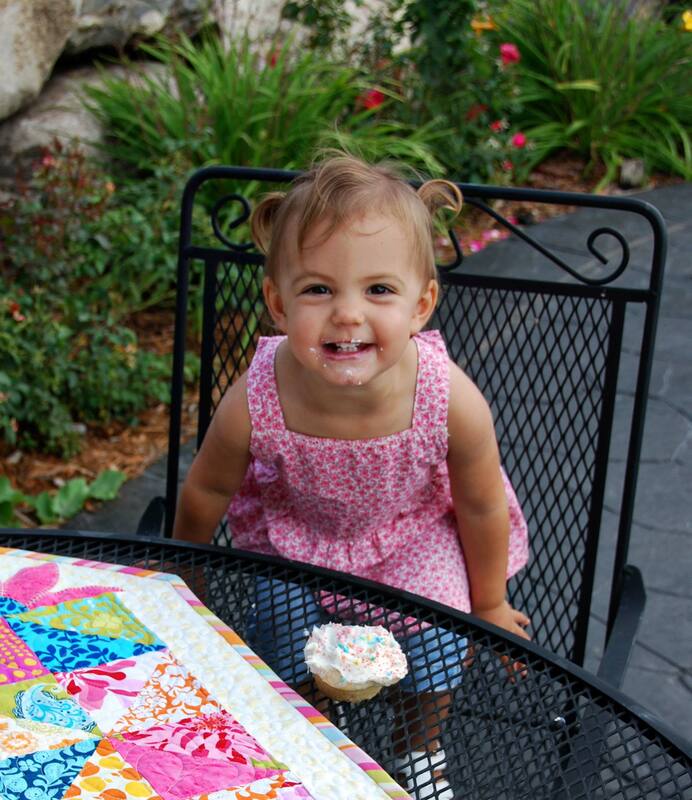 Congratulations on your blog anniversary (and on your new fabric line — love it!!)! Your blog is a joy to visit for both quilting and knitting ideas. Thanks for all the inspiration. I’m new to your blog, but I’m here to learn new ideas. And so far I like what I’ve seen! I just found your blog today! I love your quilts and your fabrics. I’ll be checking back often… I hope I’m not too late for the giveaway! I love seeing your newest ideas and desgins, but I have adopted the HMP binding technique… great advise! I’m a novice quilter who putz’d with quilting for years, but recently retired and still young (or so I think) I’ve been taking quilting much more serious. Your blog is fun, colorful, inspiring and interesting. Keep up the good work. I just posted a blog about your giveaway! What an amazing giveaway! I have so many of your patterns/books and they are just amazing! What a generous generous give-away and how lovely that the fabric designer sent you a signed book! What a great giveaway. You are an amazing person and I have many of your patterns/books. I am using your beautiful Cottage Charm line to make my daughters’ bed quilts and do some decorating. I love it. I also think anyone would be lucky to win one of your quilts. I have added you to my blog role. I’m adding more blogs all the time as I discover so many talented people out there. I think you’re great. Good luck with your book. I love the simplicity of your pattern designs. I would love to see a tutorial in the future about how you hang your quilts on the wall. Congrats on a year of blogging! I have enjoyed reading about your dream house renovations, and seeing how you decorate with your quilts. I have also read your tutorials about binding by hand, although I don’t get that far very often:) Great giveaway prizes! I’ll be back with more comments. Oh, what a lovely surprise that would be to win! I marvel at your machine quilting, and would love for you to give some tips or tutorials on successful machine quilting. You’re on my blog roll too. Now I have two chances in ????? of winning. Crossing my fingers. I’m back with the link to my post about your giveaway. I just found your blog! Congrats on your one year! Thanks for the great giveaway!!! I love the tips on binding easy to understand and mine turned out great! I jsut love the April Cornell fabric. My mom used to buy my daughter dresses from the April Cornell store in Denver. She has outgrown them all but a quilt lasts forever! You inspire me to try color combinations that I might not otherwise try. THANKS! I have only been reading quilt blogs for a short amount of time, and what I like about your blog is all the quilts and patterns you get done. I can’t believe all that you do and still have time to blog about it. I love your newly remolded bedroom and the quilt on your bed. I just had to buy your living large book so I can make the quilt and runner! Thank you for sharing everything, you are the greatest. I don’t have a blog, but I did bookmark your blog on my computer so I can check out your blog alot. I would love to win one of your quilts. I enjoy following your blog to see new color ideas, new decorating ideas (as you redid your house). And yes, you have been on my Google Reader. Hope I’m one of the lucky ones in your generous giveaway! I just love the tips and tools and inside look at your designs. i have really enjoyed learning about your design process! congrats on one year of blogging! and lastly you are on my blog roll! It’s exciting that you are giving away prizes for your blogiversary. That is very generous of you. Thanks for all this chances to win your beautiful quilt. I have followed you since viewing your truck show years ago in Spearfish SD. I was visiting My dear friend and Grandma-in-law (we share the same Granddaughter). I live in the East, and am an ERP~ East River Person and she is West River Person of South Dakota My friend was able to see you this August again in Spearfish and I hope she got an autograph book for ME!! I am new to blogging for myself and do not understand the how to’s very well. Your quilts are so beautiful and have a distincitve flavor! The quilting is beautifully done,as is the[photography to see such detail up close, I’m in love! Happy Bloganniversary! this is my first time here, and i see your quilts are beautiful! would love to win one! thanks for the opportunity! i am going to blog about it too!!! There is no better place for a cupcake than on the face of a child. wonderful .. ..CONGRATULATIONS on you blogaversary – what I have enjoyed reading is you have an amazing way of sharing you heart with us all… your life and your amazing designs.. THANKYOU…. I launched my first pattern on Etsy using ‘Cottage Charm’ an am making some other things with it as I bought loads of it. I blogged about this wonderful giveaway THNAKYOU! and my blog roll has a link to your blog as well. Keep creating your lovely quilts and designs- they are all beautiful. Well, I enjoyed learning that your blog exists! I don’t think I’ve ever visited it before, but came over by way of Camille of Simplify. I really like that you showed two color options for the free quilt pattern as the look is so different! I’ve also added you to my blogroll. Happy blogversary! Crafty wishes for you!! I love the “before and afters”….while in the midsts of rennovating, I need reminders that the “afters” do indeed come! I love your blog and your books and patterns I read them like novels before going to sleep!! The photography is so beautiful and full of colour and vibrancy as your quilts are. I enjoy how you talk about the process of designing and making and photographing. I would love to hear about your longarm quilting as I have a 17″ one of my own and study your quilting. I find everything about your blog inviting and enjoyable and please know that this lone quilter is here with you. I am not a member of a group of any kind and use the internet as my voyeristic journey through quiltland! I enjoy reading your blog and seeing the beautiful quilts you create, I also especially loved the flower pictures from your garden. Happy Blogversary! Thank you for sharing. I’m a newby to your blog, but looks like I’ll be following….I love your style!!! Thanks for the giveaway…I’m off to add you to my feed! You are in my blogroll. I’m glad about it. Heather I love your work and I’d be thrilled to give one of your quilts a great home, I’d even do my best not to allow any of my girls to try to relocate it :). One of the things I really learnt this year from your blog is that I needed to buy your books and how much I love your patterns and fabric lines. Also one of my daughters (20yrs) was so inspired by your site that she asked me to send her a sewing machine etc..
you have been on my blog roll from the day I first found your blog! LOVE your work…I have some of your fabric, your patterns, etc. and have been pleased with it all! I enjoy your blog and the tutorials you have. What a great giveaway this is for your readers too! Happy Blogiversary!!! Oh, you have been on my blog roll for quite some time now! I love the photos that you show of the different fabric designs and their colorways. The photography is great. Keep them coming, Heather! Please count me in for the drawing. Thanks. I’ve written about your giveaway on my blog! I have your blog on my blogroll. Heather, your quilts are wonderful. I would love to win any one of them. The fabrics are great too. I particularly like seeing the different color versions of quilts on your blog. Sometimes I tend to dismiss a quilt design because I don’t care for the colors shown, but when I see the same design in a different colorway it changes my whole perspective. Thanks for your terrific giveaway and the chance to win. I’ve added your blog to my blogroll. Your little Munchkin is just the sweetest. I know she’s not one of the prizes (sigh). I love your quilts and have put you on my blog roll. Love your binding method. And, the way you use color. Count me in, you have such sweet designs, I’d consider myself lucky to win any one of them! I don’t see my first comment, so I’m leaving another…I do follow you in Google Reader. The link I left you is for a table runner I made as a shop sample from your Sixxlin’ Sixties book. The shop I work at is getting your Minnesota Road Show trunk show in a few weeks as well! Happy Blogiversary to you! I just learned of your blog and am really sorry I didn’t discover it sooner. The competition for your giveaway looks pretty stiff, but I love those quilts so much, please include me! I’m happy to put a link to your giveaway on my blog. The more the merrier, I always say! Wow! What a generous giveaway. I am new to your blog – I’ve only been here a couple of months but I keep going back and reading older posts. Your work is so inspiring! Your quilts are gorgeous! I would love to win! Will be keeping a close eye on your blog. And your little girl – PRECIOUS! I am rather new to your site but did check out some of your tutorials a while back and the one for continuous binding helped me very much. Have to say I love the photos of your family as much as I love the quilts. I love the patterns Moda comes up with! I am new to your blog, but I LOVE that quilt! I am also new to quilting – I just finished my first. I will be returning for any bits of information I can pick up. Your blog is enjoyable and inspirational! I think what I take away from it the most is to just ENJOY the entire process of quilting, and that includes all the family and life that occurs from a project’s start to finish — to try and not sweat the small stuff! My sister and I have a passion (I use that word instead of addiction!) for quilting and have sewing Marathons throughout the year. Our last marathon included a quilt created for each of us using the “Gypsy Girl” pattern. Thank you for your creativity and hard work — we’re reaping some great rewards from it! AND, in reference to the previous comment, my sister said I had the wrong name of the quilt!!!!!!!!!!!! . . . My apologies . . . she’s looking up the correct name . . . that was embarrassing! . . . all the sentiment remains the same! I posted about your blogiversary… happy anniversary. I love reading your blog and collect (almost) all of your books &patterns. I love your style and color choices. Just discovered your blog and am going to read back a little to see about this house renovation everyone is talking about. Happy blogiversary! I have heard my mom talk about your site and thought I’d take a look around! Your style of traditional combined with trendy is the look I like in quilts. I hope to find some unique patterns and ideas here. Your blog is lovely. I enjoyed seeing the quilts, especially the one with my line for Moda. (!) A little self-serving, but true. Thank you for sharing your gifts and work with the rest of us. You are on my blog roll! Truly a favorite! Love your blog. Just found you. I just found your blog from Wish Upon a Quilt Shop. Your helper is SOOO adorable. I love your designs and close up photography so you can really see the details. Thanks for the contest:)) I love contests. I appreciate the hard work you put into your quilts, they are beautiful and the love you put into making them shines through! I’ve added your site to my google reader.